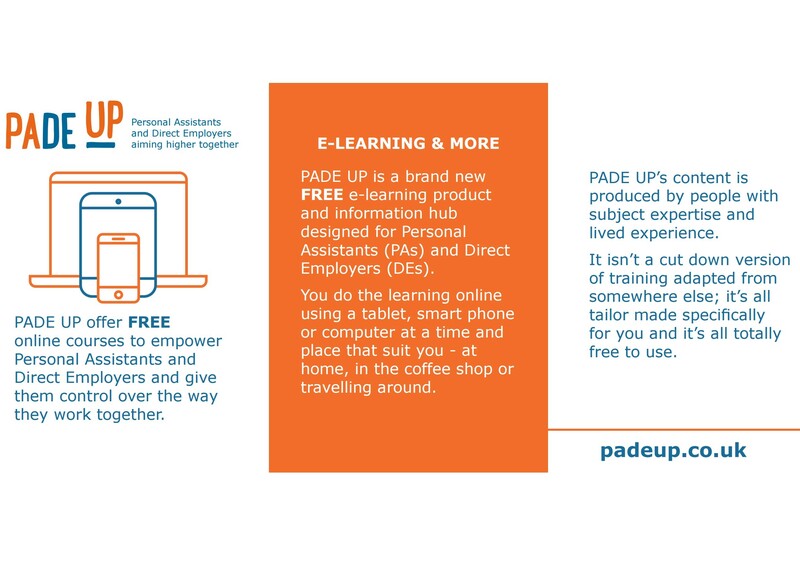 PADE UP is a brand new e-learning product and website designed for Personal Assistants (PAs) and Direct Employers (DEs). Direct Employers are people that employ Personal Assistants. PADE UP enables you to learn at your own pace, gaining knowledge and skills. You do the learning online using a tablet, smart phone or computer. At home, in the coffee shop or travelling around – at a time and place that suit you. Sounds great – what courses are there? There are 11 e-learning modules on the website, some specifically for Personal Assistants and Direct Employers and some for both. You will get a certificate each time you successfully complete each course. I’m interested – how can I find out more? 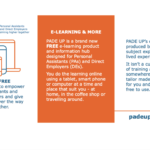 You can also join us at a PADE UP event near you to find out more. Real is organising an event in each of 7 boroughs in North East London – Tower Hamlets, Havering, Hackney, Waltham Forest, Barking and Dagenham, Redbridge and Newham. We want Personal Assistants and Direct Employers who live in each of these 7 boroughs to come along. The events will be in accessible venues in each borough. At the events you can register with PADE UP and try out PADE UP’s courses. We’ll have taster sessions, giving you a chance to try the e-learning modules yourself. You’ll also get to meet lots of other Personal Assistants and Direct Employers. There’ll be lots of help there if you need it – you don’t need to know anything about computers or the internet. We’ll help you through it. If you do have a smart phone or table bring it along, but don’t worry, all you need to bring is an interest in learning more! We’ll also provide information on how you can get help to learn more about computers and the internet. Much of it can be free! When will the events be? How do I book? We are arranging these now and will post details of the events here as soon as they are organised. They will all be between January and March 2018. Check out our news section for notice of these events here. 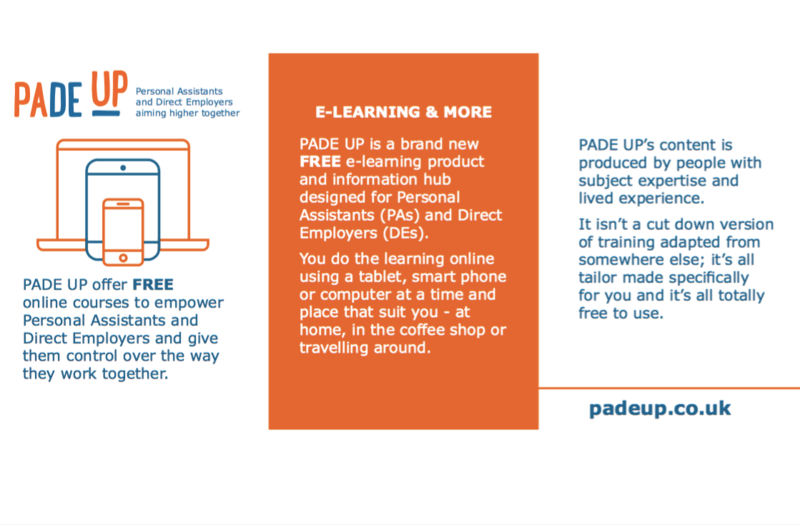 PADE UP is FREE to use – Personal Assistants and Direct Employers do not have to pay. The events are also free to attend. What help can I get to attend an event? We can help with your travel costs getting there. And we can help cover the cost of having your Personal Assistant there – to reimburse employers for the cost of having your Personal Assistant with you or sending them to the session in their work time. Do I have to attend the event in my borough? No. You can attend any event that you want to. I’m a Personal Assistant – do I have to come with my Employer? You don’t have to come with your employer but we do recommend that you talk to your employer about it. They may be able to pay you to be at the event as part of your work – we have funding to reimburse the cost of this. They also may want to come with you so that you can both learn together. You can also come in your own time. If you do, you can still claim help with your travel costs.